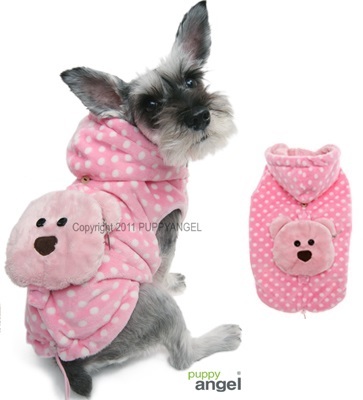 So soft and sweet these Puppy Angel De Poo Jackets are a treat! Made from spotty soft velour each hooded dog jacket has a cute bear backpack on the back. This can be removed and filled with your pet's belongings! The jacket fastens down the chest using YKK approved buttons and there is a toggle on the bottom to aid fit. Availablle in XS S SM M L XL.